An old fashioned Tiki bar in the middle of Waikiki serving Hawaiian food and tropical cocktails in real pineapples and coconuts with music every night. 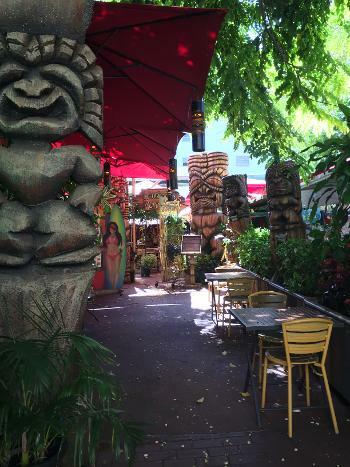 You can call us a Tiki Bar, a cocktail lounge, a cocktail bar but we prefer to call it Cuckoo Coconuts Waikiki or CC's for short. Hours tend to be 5 PM to midnight. Tiki bars come in all varieties, from cramped dives to spacious beach front lounges and even some commercial joints. With Cuckoo Coconuts, you’re getting a feeling of Hawaiian ambiance. We have nightly live local music from 7-10 PM (noise ordinance rules); and food representation of the islands prepared on site though we have to avoid reusable plates and glasses (more ordinances). 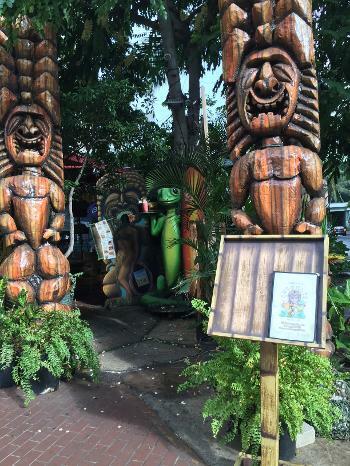 You’ll be greeted by huge tiki gods rustically displayed with Hawaiian foliage. There are no ceilings, no walls, no doors. While we are not located on the ocean, we are on Royal Hawaiian Avenue between Kalakaua and Kuhio in the middle of Waikiki where you can take a break from shopping anytime between 5 PM and Midnight--sometimes longer. We try to give you the Hawaiian ambiance without charging you extra for take home glasses, sunscreen, and towels for wiping ocean spray from your table. We are an outside bar where umbrellas will keep you dry most of the time. We will close during a full onslaught of a hurricane. We may occasionally remain open a bit after midnight if the tiki gods approve and our only remaining customer orders another drink (after all, this is Hawaii). Hawaii may not be the birthplace of the tiki tradition and Cuckoo Coconuts Waikiki may not be following the rules of Tiki traditions (Plastic cups, really?). Some may turn up their noses at our fun loving interpretation and approach to the culture of aloha and tiki, but what better place to drink a Freaky Tiki rum cocktail than Hawaii? We’ve got the beaches, the tropical weather, and the swaying palm trees. We’ve also got laws, rules, regulations, inspectors, landlords and vendors who insist how we have to operate (Plastic cups, REALLY!). Come visit us in Waikiki, order a tropical cocktail, maybe some food, sit back and enjoy the ambiance of Hawaii and let us deal with all the other stuff but don’t tap your drink with your diamond ring expecting to hear the chime of crystal. Rick, Sascha and Abby ready to serve you...eventually.